The Concerned Lawyers for Justice (CLJ) refers to the Malay Mail Online news report of 21 April 2015 titled “Churches may operate in commercial areas without permits, Selangor exco says”. CLJ notes that the news report quotes Elizabeth Wong, a Selangor executive councillor and co-chair of the Selangor state committee on non-Islamic affairs (HESI) stating that the Petaling Jaya Municipal Council (MBPJ) has been allowing churches to operate without permits since 2008 (the starting point presumably being when the Pakatan Rakyat state government came to power in Selangor) and that all such churches have since then only needed to notify HESI, supposedly in accordance with Article 11 of the Federal Constitution guaranteeing freedom of worship. 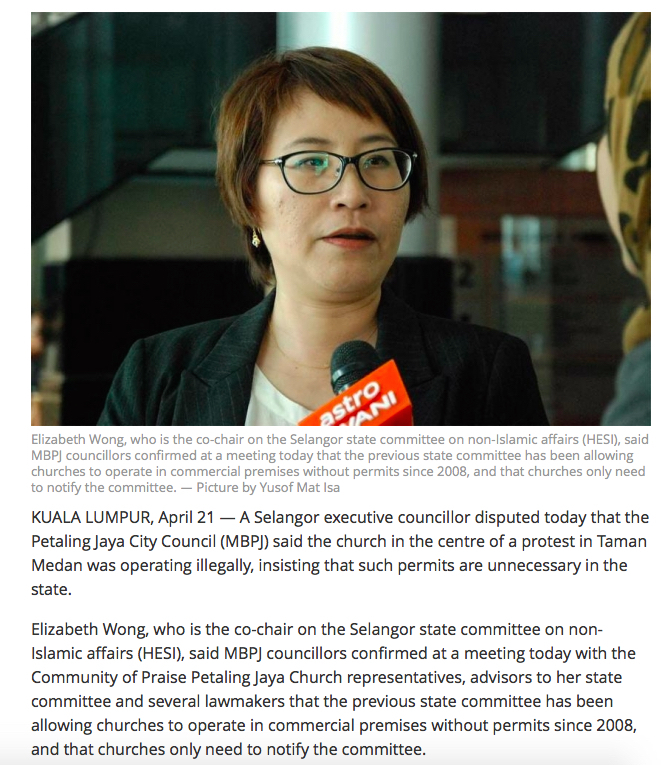 The same news report quotes her as contradicting an earlier stand taken by MBPJ public relations officer Zainun Zakaria that churches operating at commercial premises need to obtain a permit before they can do so according to law. CLJ condemns the statement of Elizabeth Wong in this regard as it misleads the public, particularly in relation to the contents of Article 11 of our Constitution. CLJ would like to remind Elizabeth Wong that as an elected officer of the state, she is duty bound to uphold the rule of law, in particular the Federal Constitution and must not misrepresent the same. Even a cursory glance of Article 11 would reveal that freedom of worship and the right of religious organisations to own and manage any place of worship is not absolute but must be done in line with the law. Article 11(3)(c) in particular states that every religious group has the right to acquire and own property and hold and administer it in accordance with law. It is thus manifestly clear that it is illegal and an offence for any person, including a religious organisation, to convert any residential or commercial property for any other use, including for any place of worship, without first obtaining prior written permission from the relevant local authority. It is also not within the competence nor jurisdiction of Elizabeth Wong nor HESI to ignore or waive a requirement that is clearly provided for in validly passed and enacted Federal legislation which clearly comes within the ambit envisaged by Article 11(3) of the Constitution. Therefore, CLJ views with disquiet the supposed practice of the Selangor local authorities and HESI in not requiring written permission in respect of the operation of churches since 2008 and urges the relevant authorities to investigate this matter. April 26, 2015 in Perlembagaan Persekutuan.